A few weeks ago, the Supreme Court of India delivered three landmark judgments. Starting with its verdict on Vodafone, a few days later, the court delivered a ruling that a complaint under the Prevention of Corruption Act is a citizen’s constitutional right and the competent authority must take a decision within three months on whether or not to grant sanction for prosecution. Two days later, the court held the allocation of 2G licences as arbitrary and illegal and, consequently, cancelled all 122 licences granted. Say what one may, but all these judgments reinstate the supremacy of the rule of law and affirm one’s belief in the independent and effective functioning of the Indian judiciary. Given that in all these judgments the government is a contesting party and since the ramifications of these verdicts are far beyond the cases in which they were delivered, the government is now looking to seek a judicial review in all these matters. Before we assume that by filing a review, the government is questioning judicial authority or jump to conclusions that some of the certainty these judgments had delivered may get undone, let us examine the legal framework regarding seeking review of judgments of the court. The Constitution provides that the court has the power to review any judgment made by it. It further provides that the court may make any rules for regulating its practice and procedure or set down conditions, subject to which a judgment passed by it may be reviewed. Additionally, the Supreme Court rules stipulate that an application for review must be filed by way of a petition within a period of 30 days from the original judgment and is normally heard in chambers, by the same Bench that heard the original case. It is expected that such petition will clearly set out the grounds on which the review is sought and such grounds must be in keeping with the requirements prescribed in the Code of Civil Procedure. Notably, the code provides very limited grounds either on account of discovery of new/important evidence that was not available at the time when the dispute was originally heard or on account of some mistake or ‘error apparent’ on the face of the record. Applying the above stated principles, the court has held that the power of review is to be exercised with extreme care, caution and circumspection. Additionally, a review should be entertained only in very exceptional cases where the court has overlooked a material statutory provision or if a manifest wrong has been done, which must be corrected. Distinguishing statutory provisions from facts, the court has also held that where a question is raised in a review petition, which was open to be raised in the original petition, but had not been raised, then the court will not permit such question to be advanced in a review. A review is not a rehearing and cannot be used to re-agitate issues previously argued. 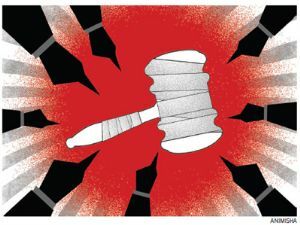 While the issue of error has been addressed, what happens if a judicial decision is passed questioning a policy issue or matters falling exclusively within executive domain? Is the decision of the court the final word and authority? Simply stated, the answer is: yes! Courts have accepted the philosophy of human fallibility and, hence, provided for review, but generally speaking, the courts don’t look favourably at review petitions. This is because review literally, and even judicially, means re-examination or reconsideration and the courts believe that in the realm of law, the courts and even the statutes lean strongly in favour of finality of decisions legally and properly made. Hence, while a review will be entertained to remove an error, it is almost never exercised to disturb finality achieved through a judicial process, unless such interference is to prevent grave injustice.Consequently, the only check on the judiciary’s exercise of powers is the self-imposed discipline of self-restraint. The court has itself ruled that the judiciary must exercise judicial restraint and the judges must not try to run the government. But let us accept that, at times, it is difficult to exercise restraint when the executive and legislature are falling short of performing their duties or where administrative action is blatantly arbitrary and biased, as had been noted in the 2G scam case. But even then, the court has acknowledged that while conducting judicial review of administrative action, the court cannot act as the appellate authority and substitute its views for the views of the decision-making authority. The role of the court is limited to ensure that the decision was passed in keeping with well-established principles of transparency, fairness and natural justice. And when acting as the appellate authority, the court needs to examine only questions of law and ensure that subordinate courts correctly appreciated facts and appropriately interpreted the law. In conclusion, as regards review petitions that have been or may be filed, it is difficult to comment with any authority without studying the grounds on which the review is sought. Equally, it would be improper to speculate or even comment on their outcome given they are sub-judice. But based on precedence, it is hard to comprehend the court re-examining issues that were most likely examined during the initial hearing and on which the court applied its time and attention before delivering detailed judgments. But it’s a different matter if some material brought to the attention of the court has not been considered while deciding the case. Hence, in the Vodafone case, depending on the outcome of the review, if the department is worried about the purported loss of revenue and bad precedence getting established, it would most likely seek to provide for taxation of Vodafone-type transactions in the Direct Taxes Code or by bringing about amendments in the Income-Tax Act. It’s true, no one likes Parliament enacting laws only to overcome judicial rulings. Then again, to survive in this era of coalition politics, sometimes the government is compelled to take decisions that can’t please everyone.